Azerbaijanis or Azeris (Azerbaijani: Azərbaycanlılar آذربایجانلیلار, Azərilər آذری لر) are a Turkic people. Azerbaijanis are predominantly Shia Muslims living throughout Caucasus, northern Iran and eastern Turkey. 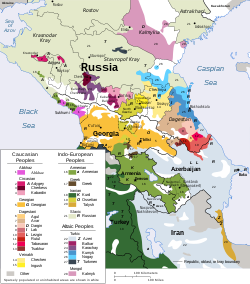 Traditionally, Azerbaijanis live in Azerbaijan, Iran, Russia (Dagestan), Turkey (Kars and Iğdır) and Georgia (Borchali). Regardless of ethnicity or emigration, this list also includes famous natives of Azerbaijan, as well as people who were born elsewhere but spent most of their active life in Azerbaijan. Some Azerbaijanis were born in one country, but gained fame in another. Here, they are indicated only by place of birth. This list also includes people who have at least one parent of Azerbaijani origin. Azim Azimzade was an Azerbaijani artist and prominent cartoonist. Mahammad Hasan Movlazadeh Shakavi was an alim, the first Sheikh ul-Islam of the Caucasus, and the first scholar who translated Quran into Azerbaijani language. Abbasgulu Bakikhanov is known for founding Azerbaijani scientific historiography. Mirza Adigozal bey (1780s–1840), historian of the 19th century, author of a historical work "Garabaghname"
Huseyn Khan Nakhchivanski was General of the Russian Cavalry under the Russian Emperor Nicholas II. Mehdi Huseynzade was a legendary guerrilla and reconnaissance, made famous daring operations against the German and Italian invaders during the Second World War in Yugoslavia and Italy, Hero of the Soviet Union. Uzeyir Hajibeyov is recognized as the father of Azerbaijani classical music and opera. He composed the national anthem of Azerbaijan. Alim Qasimov is the winner of the International Music Council's UNESCO Music Prize, one of the highest international accolades for music. Diana Hajiyeva, Azerbaijan's representative in 2017 Eurovision Song Contest. Yagub Mammadov (1930–2002), mugham singer. Fatali Khan Khoyski was the first Prime Minister of the independent Azerbaijan Democratic Republic. Mammad Amin Rasulzade was the only president of the Azerbaijan Democratic Republic. Fatali Khan Khoyski (1875–1920), politician, attorney, and one of the founding leaders of Azerbaijan Democratic Republic. Hasan Abdullayev (1918–1993), physicist, scientist and public official, President of the National Academy of Sciences of the Azerbaijan SSR. Tofiq Bahramov became the first referee to have a stadium named after him. Gurban Gurbanov is Azerbaijan's all-time leading goal scorer in international matches and most successful manager in European cups. Shakhriyar Mamedyarov is the 2013 World Rapid Chess Champion. Khurshidbanu Natavan was the daughter of Mehdi Gulu–khan, the last ruler of the Karabakh khanate (1748–1822); she is considered one of the best lyrical poets of Azerbaijan. Mikayil Mushfig was an Azerbaijani poet of the 1930s. Though he was not opposed to the Soviets, his name was entered in a list of counter-revolutionaries by his own countrymen. He was arrested and executed by the Soviet authorities at the age of 30. Mohammad Kazem Shariatmadari was a Grand Ayatollah. Sattar Khan was a key figure in the Iranian Constitutional Revolution and one of the greatest heroes of Persia (Iran). Ahmad Kasravi, one of the most famous Iranians in Iran's modern history. He is known for his discovery of the Ancient Azari language. Mohammad Hossein Shahriar was an outstanding Azerbaijani poet from Iran. Servet Çetin is a member of the Turkey national football team. Nariman Narimanov was a writer and a major public and political figure in Azerbaijan. Nigar Shikhlinskaya was the first Azerbaijani nurse. Ramil Sheydayev is a member of the Russia national football team. Mammad agha Shahtakhtinski was an Azerbaijani linguist and public figure. Sibel Edmonds is a founder of the National Security Whistleblowers Coalition (NSWBC). Fuzûlî is considered one of the greatest contributors to the Dîvân tradition of Azerbaijani literature. ^ "Бабаев Мирза Абдулджаббар оглы". kino–teatr.ru. ^ "Бадирбейли (Джаванширова) Лейла Агалар–кызы". kino–teatr.ru. ^ Вагит Юсуфович Алекперов. Биографическая справка (in Russian). РИА Новости. 12 March 2009. ^ Валерий Кичин (24 January 2007). Старый князь и новые проблемы (in Russian). "Российская газета". Я азербайджанец, я люблю свой народ, но большую часть жизни прожил в России. ^ Мамедов Исрафил Магерам Оглы (in Russian). Heroes of the country. ^ Амиров Фикрет Мешади Джамиль оглы (in Russian). Heroes of the country. ^ СЕВДА БАБАЕВА (28 June 2002). АМИНА ФИГАРОВА: "БАКУ ВСЕГДА СО МНОЙ" (in Russian). ВЫШКА. "Вы знаете, я сама чистокровная азербайджанка. Но папа больше похож на иностранца. Они с моим мужем очень похожи. Так, что трудно мне не было." ^ "Магомаев вернулся в Кремль по приказу Андропова. Российская Газета, Пятница, 16 августа 2002 г, No 153 (3021)". www.rg.ru. ^ Керимов Керим Аббас–Алиевич (in Russian). Heroes of the country. ^ Наталья Лебедева (27 September 2005). Открытие сибирской нефти как полет Гагарина (in Russian). "Российская газета". ^ Betty Blair. "Short Biographical Sketch". Azerbaijan International, Winter 1994 (2.4), page 49. Accessed August 19, 2005. ^ А.М.Вартанян (2008-08-13). "Старая гвардия" иранских консерваторов в лицах: аятолла Али Мешкини (in Russian). Институт Ближнего Востока. Этнический азербайджанец (как и Хаменеи), А.Мешкини на протяжении многих лет бессменно возглавляет один из ключевых органов власти в Иране, отвечающий за выбор Рахбара – Собрание экспертов (СЭ). ^ "In memorial of Grand Ayatallah Seyyed Mohammad Kazzen Shariatmadari". yatollahshariatmadari.com. Archived from the original on 2013-08-03. ^ Harris, Craig. "Hossein Alizâdeh > Biography". Allmusic. Retrieved August 18, 2010. Alizadeh was destined to become a musician. His mother, a Persian from Arak, and his father, an Azeri from Urmia, both loved music. ^ "The Great Big Eurovision Experiment 2009 – Azerbaijan". Eurovisionblog.wordpress.com. 2009-05-05. Retrieved 2011-05-28. ^ "Azerbaijan at Eurovision Song Contest 2009 - Азербайджан на конкурсе песни Евровидение 2009". esckaz.com. ^ "Араш Лабаф, увидев Путина, чуть не упал в обморок". ^ "Касумов Мир Башир Фаттах оглы". БСЭ. ^ "Iran and the Caucasus: The Triumph of Pragmatism over Ideology – Centre for World Dialogue". Worlddialogue.org. Archived from the original on 2013-09-27. Retrieved 2011-05-28. ^ "ḤAYDAR KHAN ʿAMU–OḠLI". Encyclopædia Iranica. ^ Ali Javan Archived 2012-10-23 at WebCite web–page of 'Farhang–Sara' / Born in Tehran of Azerbaijani parentage, Javan came to the United States in 1949 where shortly afterwards he received his Ph.D. at Columbia University in New York City. He's been with the Massachusetts Institute of Technology (MIT) since 1962. ^ "Набати Сеид Абульгасем". БСЭ. ^ "Cem Karaca: Yakında ben de geliyorum" (in Turkish). Hürriyet. 10 February 2004. ^ ДЖЕМАЛЬ Гейдар Джахидович – БД "Лабиринт" (in Russian). База данных "Лабиринт. ^ ЗУЛЬФУГАРОВ Тофиг – БД "Лабиринт" (in Russian). База данных "Лабиринт. ^ "Hacıyev Etibar Firudin oğlu". milliqahraman.az. ^ Charles Raymond Snow (2008). The Case Against Iran. Trafford Publishing. p. 129. ISBN 978-1-4251-7596-2. ^ "Maryland Terrapins player bio". Umterps.com. Retrieved December 28, 2012.